Capron Funk is one of the craziest, most technical/combination enriched riders that the world has ever seen. His capablities on his front wheel are almost unmatched by any other rider. Everytime I ride with him, whether it be at an event or just a random session, he is impressing me with a new trick he is doing. Lucky Scooters just recently picked up Capron as their newest pro team rider so I figured I needed to get an interview with him. This is "Capron Funk's Welcome Interview". Read and enjoy! Blake Bailor: What's up Capron? 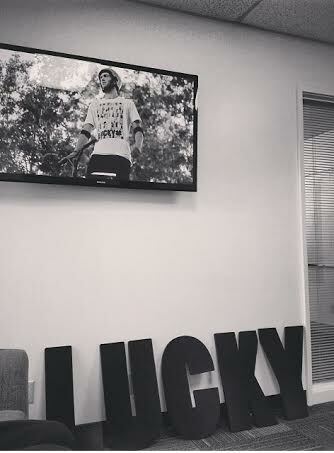 Can we get a little introduction into who Lucky's newest pro rider is? Capron Funk: Chillen at home at the moment just finished a game of Call of Duty Ghosts. Hey guys! I ride everyday, my local park is Cal Oaks, Ca. Im an avid photographer. I have little bro named Corey and i do alot of frontflips and nose grabs. Blake: Awesome! How did getting picked up by Lucky Scooters come about? and what gave you the desire to ride for the company? Capron: Well it first caught my interest when my brother got on the Dirt Team and i remember my mom and dad explaining to me how legitimate lucky was as a business and sponsor. Its hard to find companies these days that put there riders first. So my main desire to ride for them are the parts, trustworthiness and integrity. Blake: Those are all rad reasons to choose a sponsor! Your latest and greatest video just dropped, entitled "Welcome to Lucky Pro", how much time and effort went into that video? Those tricks were unreal! Capron: Well most of the clips were old and only about 7-10 clips were flimed right after i got my lucky complete. So i would say about 2 months and alot of falls. Blake: Sounds like some hard work went into it then! What trick in that video took you the longest to land and how long would you say? Capron: Hmmmmmm, the 2nd clips took me about 30 mins (whip rewind to nose grab whip), i landed it once but my foot dragged and i wanted it to be cleaner so i redid it. Blake: You have been a name in scootering for sometime now, but it's always interesting to see who people's influences were coming up. Who did you look up to when you were coming up as a young rider? Capron: Mainly Tyler Bonner, Raymond Warner, Martin Kimbell and Terry Price. I look up to everyone in a different way. Blake: Those are all great riders to look up to! You have been a force to be reckoned with, in the U.S. competition scene, how do you usually approach contests? Capron: I try to put together a solid run that i feel as though the judges will like and i just have fun with it. Blake: Any rituals that you like to do? Capron: I always drink A Monster Kahos and give my brother knuckles. Blake: Well that sounds like a good way to get it going! Now that Lucky has picked you up, what can we expect from you in 2014? Capron: More Edit, tutorials and more stuff with my brother and I.
Blake: Awesome dude! Thanks for doing the interview and welcome to the family! Any last words? Capron: Thanks to my Mom for helping me get to where im at and thanks to Lucky for being so supportive.